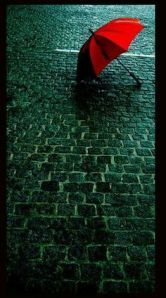 Evil descends, dealing death beneath my protection; spitting crimson onto cobblestones, staining their age worn surface. Thunderheads swell in the thick midnight sky; belching anger from their gullets, cleansing the time-honored ritual. Pulsing beneath the damp stone surface, latent life resides, drinking the remnants of death, gathering and spreading strength. A telltale flicker, a street lamp breathes. Flushing rust from its cast iron skin, it blackens, splashing healing light across the wasting stones, pushing youth into their haggard grey pores. Shadows scatter across a building’s façade, fleeing over decayed trim, darting between shards of shattered reflections. High above the pursuing light, they seek sanctuary. Spilling through the aperture’s void, his mass reforms; rising from scraps of blackened mist, driving light from his core. Satisfied, he lingers only for a moment. His offering accepted; he drops into darkness.